South Africa is an extremely unequal society. The post-apartheid dispensation has seen the situation of the majority poor black working class worsening (characterised by increasing unemployment, a lack of adequate and affordable service delivery and exacerbated by rampant inflation). On the other side of the coin, a few elites have ‘made it’ in capitalism and through the state, often through the elitist forms of ‘Broad Based Black Economic Empowerment (BBBEE)’ and corruption. Inequality in South Africa is easily illustrated when one observes the massive disparities in development, service delivery and wealth between townships and rural areas on the one hand, and suburban areas on the other. Nationally, South Africa faces a massive backlog in service delivery. 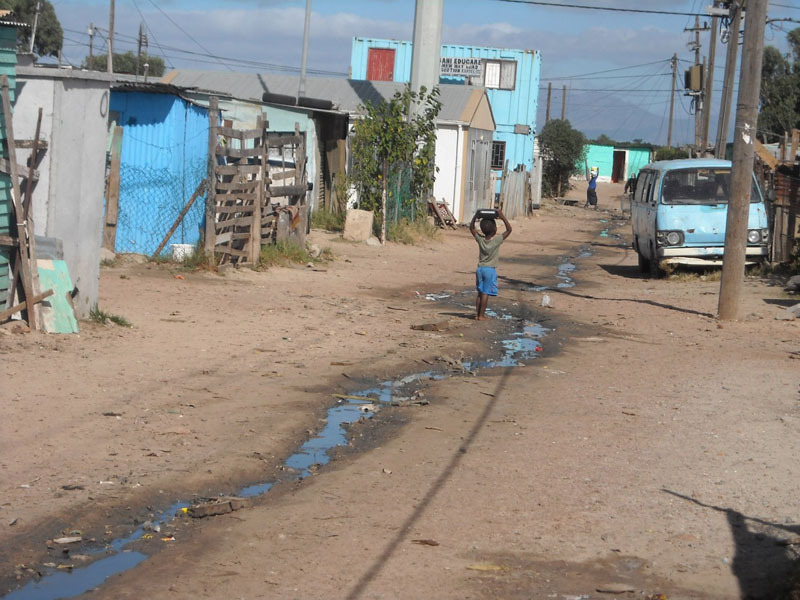 Some 203 out of 284 South African municipalities are unable to provide sanitation to 40% of their residents. This means that in 71% of municipal areas, most people do not have flush toilets. A staggering 887 329 people still use the bucket system and 5 million people, or 10.5% of the population, have no access to sanitation at all. It is perfectly understandable, then, why working class and poor people take to the streets in protest against poor and costly service delivery; it is these same people that are impacted most by insufficient and costly service delivery, corruption and municipal mismanagement. The post-apartheid state’s promise of an extensive roll out of service delivery in 1994 has been severly undermined by its long standing neoliberal approach to the provision of services (discussed in the next section). While the state has made some headway in rolling out services since 1994, thousands of communities living in rural areas and townships continue to receive inadequate services. Moreover, the private sector approach has meant that where services have been provided, the costs have generally been transferred to poor communities who often cannot afford them. The ability and willingness of the South African state to provide adequate service delivery to all is not simply a question of having the ‘right’ political party or sufficiently skilled people in power. Nor is it simply a question of having good policies, or the adequate administrative means or technical capacity to implement it. Should massive disparities in service delivery between wealthy and poor neighbourhoods be put down to corruption, mismanagement, administrative incapacity and a lack of consultation? Or is there something in how the state is structured and the way in which it rules which means that it can never give the majority of people what they need? Privatisation, at its most basic, refers to the state selling off public enterprises to capitalists. The theory behind this neo-liberal approach is that that once privatised; service delivery will become more efficient, cost effective and far-reaching. The privatisation of electricity provision through the installation of prepaid electricity meters in township homes is a case in point. Electricity privatisation through pre-paid meters ensured that the price of electricity shot up dramatically – up to 20 per cent in some cases. Between 1993 and early 1994 the ANC, in conjunction with its alliance partners, the Congress of South African Trade Unions (Cosatu) and the South African Communist Party (SACP), created the Reconstruction and Development Programme (RDP). The RDP could be seen as the election manifesto of the ANC in 1994, maintaining elements of the 1955 freedom charter and promising and end to the social and economic inequalities generated under apartheid. The RDP election manifesto was put into effect in 1994 with the adoption of the RDP white paper. The RDP overall contained a set of ‘Keynesian’ macroeconomic measures, which stipulated that the state ought to take the lead in delivering services, housing and infrastructure to the majority poor, mostly black popular classes. However, the RDP election manifesto also, and this is less well known, already contained some neoliberal elements alongside Keynesianism. The White Paper brought neoliberalism to the fore, firmly establishing it as the basic framework. This means that the ANC didn’t just step into a neoliberal state and take its programme on board: it actively endorsed and adopted the neoliberal framework, evident in its very first general policy document. The RDP was soon replaced by the Growth, Employment and Redistribution (GEAR) macroeconomic framework in 1996. GEAR essentially promoted a far more aggressively neoliberal approach to the state and the market, firmly consolidating the ANC’s neoliberal orientation. Very broadly, GEAR promoted the privatisation of ‘non strategic’ state assets and services, liberalised trade and promoted “flexiblily” in the labour market. Despite claims that neoliberalism represents a weakening of the state, in fact it merely designates it a different role: maintaining law and protecting private property, while creating a suitable environment for the functioning of the market (including infrastructure provision for the benefit of business), The role of the state in intervening directly in markets is what is undermined in neoliberalism, not the state itself. GEAR promoted privatisation, according to its own justifications, as a means to attaining efficient and far-reaching service delivery – by placing it in the hands of the supposedly more efficient private sector. Neoliberal theory is based on the assumption that unfettered competition in the free market will deliver the greatest good to the greatest number of people. It argues that state intervention into markets, such as the state owning and operating enterprises which it itself subsidises, leads to uncompetitiveness (higher prices for consumers) and inefficiency in service delivery. Privatisation has been deployed, according to the state, to make the delivery of services more efficient, and to help municipalities in particular to save money so that they can provide services better. Although selling off ‘non-strategic’ SOEs can allow the state to commit less capital and administrative capacity, it can also allow the state to raise capital for other projects from the proceeds of selling the asset to a private sector buyer. Crucially, the post-apartheid neoliberal state sought to justify the imposition of neoliberal restructuring by appropriating Keynesian and developmental language and rhetoric from aspects of the RDP and by arguing that GEAR was the means to which goals of the RDP could be achieved. Behind the rhetoric however, GEAR represented the ultimate and final consolidation of ANC neoliberalism and its abandonment of even a paper commitment to Keynesian policies. There are three structural characteristics of the state that are common to all states. Firstly, all states are fundamentally undemocratic and largely unaccountable to the citizenry; secondly, all states are hierarchically organised, with those at the top unaccountable to those at the bottom; and thirdly, all states have a bias in favour of serving the long-term interests of the ruling classes. The South African state, at all levels, is no exception. It’s character has implications for how services are delivered and how we understand corruption. Analysing it helps us to assess the prospects for popular class interests to be leveraged and maintained through the state. Firstly, the local state in South Africa is fundamentally undemocratic because state managers are not accountable to their constituents; people can only vote for new state managers once every five years and have no control over them in the interim period. Secondly, because of the hierarchical structure of the local state, high level managers are not accountable to subordinate workers in the state. Therefore, upper management can exercise managerial prerogative (authoritarian decision-making) to promote their own interests ahead of those of subordinates and ahead of the class interests of the popular classes. Thirdly, by virtue of the local state’s undemocratic and hierarchical structure, it can be, and indeed is used by the ruling classes to secure the interests of the ruling class (the state managers and capitalists) at the expense of the popular classes (the workers and the poor). Several factors combine to help explain why services are not delivered to the poor: the statist structure of municipalities (regardless of the party in power), privatisation of basic services, pervasive corruption and mismanagement including the under-spending of budgets and the over-spending on state managers’ salaries. This is compounded by the fact that the poor themselves have little say in determining how services ought to be delivered. Municipalities, otherwise known as local states are the level of state that operates at the level of wards. Wards are geographical areas set up that divide provinces into smaller chunks. Municipal governments then govern a grouping of wards, which are known as a region or jurisdiction. Municipality leadership consists of a mayoral council, headed up by a mayor, a municipal manager and executive councillors, who lead the various local governments’ departments (e.g. Local Economic Development, Social Development, Health, and Education.) District Municipalities, such as the City of Johannesburg Municipality and the Ekurhuleni Metropolitan Municipality have executive, legislative and judicial functions too. This means that they have an executive that rule over wards, a legislature to formulate by-laws and have magistrate’s courts and a police force to enforce the laws. Under this layer of executive leadership are the ward councillors, who ought to represent the interests of communities to the executive council and mayor. Ward councillors should hold regular council meetings in which ordinary people can bring their grievances to the councillor who then passes them onto the executive council of the municipality for resolution. Municipalities are taken to be democratic and participatory spaces where ordinary people can participate in the decisions taken, and elect new officials should the current officials not be seen to be representing the people’s interests. However, the local state is still highly undemocratic. The ward system in particular is highly undemocratic in that ward committees often hand-pick the members they would like to participate in decision making. Over and above this, most officials at the municipal level are actually unelected. While the mayor or a councillor might be elected, the city managers and other officials are appointed by the party in power. These people often maintain their office regardless of the mayor who gets voted in. Why is Municipal government relevant? The national state argues that municipalities are better positioned to know what people need, as municipalities are allegedly institutionally closer to communities. Because the national state argues that municipalities institutionally closer to communities, decision making can allegedly be more participatory through the council system. The national state, in light of the above, argues that policies can be applied more effectively at the municipal level than at the national level. However, as was mentioned earlier, a strong case can be made that the interests and imperatives of government officials at the national, provincial and municipal levels of the state are diametrically opposed to those of the poor and the working class. The interests of capitalists and elites in government are taken by the state, at all levels, to be the interests of all. A few officials in the state may have genuinely emancipatory or egalitarian aspirations with regards to the popular classes. However well intentioned, these aspirations are never articulated in meaningful, coherent and sustained ways because of the authoritarian and hierarchical organisation of the state. Moreover, state actions that might seem to serve the interests of the popular classes, no matter how well intentioned, are always stymied by the ruling-class bias of the state. That is, the interests of the ruling classes will always trump those of the popular classes because the state exists solely to protect ruling class interests. Given the inherent class bias in the state, there cannot be a genuine unitary ‘national interest’ that is cultivated by the ruling class through the state that is ever fully accepted by the popular classes. This is reflected in policies which are created by elites who do not live in poverty or misery, are not oppressed, and have little understanding or appreciation of the day-to-day struggles poor communities face. The hierarchical structure of the state also means that policy-making cannot be democratic, and that ordinary people cannot properly participate in its structures. The implication is that the state can never give the masses what they really want. Specifically, the claims of the democratic nature of local government should be interrogated. Most municipal officials are in fact unelected. The municipal manager, for example, remains in power regardless of the party of the incumbent mayor. All of the senior members of the municipal management are in fact part of the ruling class and have used their positions for personal gain or to push forward the agenda of their own class (for example through so called ‘tenderpreneurship’). Thus, the very structure of local government means that it cannot be democratic, nor can it be participatory. Almost all municipalities have experienced corruption at one time or another. In South Africa, this predates the democratic transition – despite some common perceptions that this is somehow a new phenomenon. Because of the hierarchical character of the state and the related lack of accountability of high level officials to their subordinates and the general public, ‘shady’ tender deals with private firms and outright theft of state funds and property is the norm. The existence of such brazen forms of corruption is often put down to a lack of effective anti-corruption policies, laws and ‘checks and balances’ that fail to make officials more accountable to the national state or the public at large. However, because of its hierarchical and undemocratic structure, the state affords state managers opportunity to steal money and resources from the municipal almost unchecked. Even officials with the best intentions going into local government are unable to meaningfully make an impact. This is because rather that changing the local state; the local state changes them. Ordinary people have no control over corruption because they are never given information or control over how the money in municipalities is spent. National treasury reported that municipalities had under spent their budgets by R18,9bn in the 2009/2010 year. In the 2008/09 year aggregate net under spending was recorded at R16,6-billion, or 9,1%. In addition, despite a stipulation that no more than 30% of provincial budget allocations should be spent on salaries, the reality is that in many cases salaries absorb up to 60 percent of the budget. Local government salaries rose by 53% between 2006/2007 and 2009/2010 while municipal employment levels rose by just 4% in the same period. The City of Cape Town Municipality’s top earner was Mayor Helen Zille, who earned R858 260 (which includes a vehicle allowance of R214 564 ), while councillors received only 7 percent of the budget in 2008 and an average of 5,75 percent in 2007. In 2009 Zille’s salary will be almost R200 000 more than when she took office in March 2006, at which point her salary was R669 214. In 2009, in contrast, over 150,000 municipal workers in South Africa struck over paltry pay offers in the face of massive inflation. In an overwhelming display of unity, over 150,000 workers employed by municipalities and belonging to both South African Municipal Workers’ Union (SAMWU) and Independent Municipal and Allied Trade Union (IMATU) across the country rejected a wage offer of the employer body, South African Local Government Association (SALGA). On 27 July 2009 SAMWU and IMATU embarked on strike action in all municipalities in every province of the country. In Johannesburg 10,000 workers marched to Mary Fitzgerald Square, rejecting SALGA’s offer and reaffirming SAMWU’s demand for a 15% increase and a housing subsidy based on a R200 000 house. In Cape Town 3,000 workers marched to the SALGA provincial offices to hand over a memorandum reasserting the union’s key demands of a living wage of R4000, as well as the filling of the 25% vacant posts in the sector, and the improvement of the housing benefit. In Durban 5,000 workers marched and picketed in workplaces to ensure that no scabs performed the work of the strikers. Though the actions around the country were conducted in a peaceful and disciplined manner by SAMWU members the union expressed “outrage” at reports of police action against its members in Polokwane, where workers have been shot at and arrested. In 2011, Andries Tatane was murdered by the police while engaging in protest against the lack of service delivery in Ficksburg, Free State province. This, after his community after had “repeatedly written to the mayor and local government of Ficksburg pleading for these necessities”. Tatane’s murder shows how municipalities are willing to deploy the police in order to crush any resistance to people demanding their right to service delivery. The most recent municipal elections, held in May of 2011, promised changes to the way in which services are delivered to the poor. All of the political parties that campaigned promised heaven and earth to communities. However, nothing so far has really changed (except that some houses and toilets were built in a rush to secure votes for parties). Soon after new councillors were voted in, people unhappy with the selections were involved in the burning down of certain councillors’ houses. Many people understand the prolem to lie with ‘bad apples’ – corrupt and inefficient candidates in local government. It is believed that voting for a new trustworthy councillor or manager will bring about improvements in service delivery. But this almost never happens. This is because few criticisms are ever raised by protesters towards municipalities as structures fundamentally unable to deliver. In this paper, I argued that three characteristics of states in general, and the local state in post-apartheid South Africa in particular, prevent the poor and working class from attaining suitable services from the state. These arguments were the following: firstly, that states are fundamentally undemocratic and largely unaccountable to the citizenry; secondly, that all states are hierarchically organised, with those at the top unaccountable to those at the bottom (which allows for corruption and mismanagement); and thirdly, that all states have a bias in favour of serving the long-term interests of the ruling classes (as expressed through neoliberal forms of privatisation in service delivery). This explains why protests have become the principle means for expressing the frustrations of poor and working class communities over the provision and cost of service delivery. Protests by municipal workers are also an expression of the unwillingness of municipalities to provide better wages and working conditions for these workers. The local state in some cases is simply unable to provide adequate service delivery for poor and working class communities or decent wages for its workers. But more importantly, the local state is in fact unwilling to provide adequate service delivery and living wages because the interests of the local state are the same as the interests of the ruling class. Furthermore, the state exists to protect those interests, directly against the interests of the popular classes. According to Van der Walt (2011), South Africa’s transition to ‘democracy’ was a massive victory against national oppression, which was won from below. It is therefore incorrect to speak of the post apartheid situation as a continuation of “white supremacy”. There have been huge gains in legal and social rights; many routine apartheid practices are illegal, while affirmative action etc. is mandatory; yet the national liberation struggle was left incomplete. The ANC cannot bring about the completion of the national liberation struggle, and neither could any political party using the state for national liberation. While a political revolution may have occurred (the transition from apartheid to a national capitalist democracy) an economic revolution has not occurred. The poor are still poor, workers still exploited and only a few black people have become rich through BEE and other means. While the roll out of extensive service delivery was a key thrust of the ANC’s election manifesto, so far municipalities have not been able to carry out service delivery in a democratic fashion in a sustained an equal way. Rather, municipalities have been used by officials to enrich themselves. City of Johannesburg,(2003), downloaded from: www.coj.gov.za. Oldfield, S. (2008), “Participatory Mechanisms and Community Building Projects: Building Consensus and Conflict”. In M.van Donk, et al (eds), Consolidating Developmental Local Government: Lessons from the South African Experience. Cape Town: UCT press. Rudin, J. (2011) “Municipal Dysfunction can be Cured”. In Mail & Guardian, 7-13 October, 2011. Donelly, L. (2011) “Municipal Salary Bill Rockets while Staff Levels Stagnate” in Mail & Guardian, 16-22 September, 2011.